This new series offers leading contributions by well known chemists reviewing the state-of-the-art of this wide research area. Physical Organometallic Chemistry aims to develop new insights and to promote novel interest and investigations applicable to organometallic chemistry. 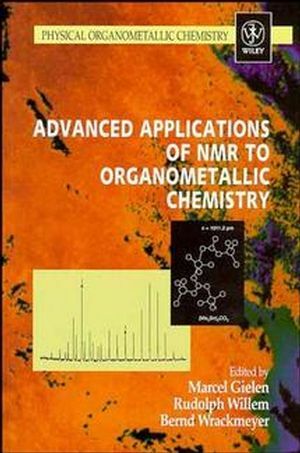 This book will prove invaluable to the NMR spectroscopist and organometallic chemists and will also be of interest to all organic, inorganic and physical chemists Contents: Selective Excitation and Selective Detection in 29Si NMR; Two-dimensional 13C, Metal Nuclei Correlation; Two-dimensional 1H-119Sn Proton Detected Correlation Spectroscopy in Coordination Chemistry of Hypervalent Organotin Compounds; Indirect Nuclear 119Sn-X Spin-Spin Coupling; Solid State NMR Applications in Organotin and Organolead Chemistry; Solid State NMR Investigations of Metal Carbonyl Complexes; High Pressure NMR in Organometallic Chemistry; Multinuclear NMR Spectroscopy in Supercritical Fluids; High Resolution 6,7Li NMR of Organolithium Compounds; Metal NMR of Organovanadium, -Niobium and -Tantalum Compounds; NMR of Metallic Nuclei in Clusters; 171Yb NMR Spectroscopy. Professor Gielen is the author of several organometallic books and editor of the journals Main Group Metal Chemistry and Applied Organometallic Chemistry. Rudolph Willem, Free University of Brussels, Belgium. Member of the Editorial Board on the journal, Applied Organometallic Chemistry. Bernd Wrackmeyer, Universitat Bayreuth, Germany. Member of the Editorial Board on the journal, Magnetic Resonance in Chemistry. Selective Excitation and Selective Detection in 2?9Si NMR (E. Kupce& B. Wrackmeyer). Two-Dimensional 1?3C-Metal Nuclei Correlation (S. Berger, etal.). Two-dimensional 1?H-1?19Sn Proton Detected Correlation Spectroscopyin Coordination Chemistry of Hypervalent Organotin Compounds (F.Kayser, et al.). Indirect Nuclear 1?19Sn-X Spin-Spin Coupling (B. Wrackmeyer). Solid State NMR Applications in Organotin and Organolead Chemistry(A. Sebald). Solid State NMR Investigations of Metal Carbonyl Complexes (S.Aime, et al.). High Pressure NMR in Organometallic Chemistry (U. Frey, etal.). Multinuclear NMR Spectroscopy in Supercritical Fluids (M. Waugh& G. Lawless). High Resolution 6?,7?Li NMR of Organolithium Compounds (H.Gunther). Metal NMR of Organovanadium, -Niobium and -Tantalum Compounds (D.Rehder & D. Rodewald). NMR of Metallic Nuclei in Clusters (P. Granger). 1?71Yb NMR Spectroscopy (J. Keates & G. Lawless).